This story originally appeared in print in the December 2014 issue of mental_floss magazine. Subscribe to our print edition here, and our iPad edition here. The first thing they noticed was the smell—like someone frying rancid meat. The two men sat in their flat in central London, awaiting their midnight appointment with the old, alcoholic Mr. Krook, who lived downstairs. As they chatted uneasily, ominous sights and smells kept distracting them. Black soot swirled through the room. A pungent yellow grease stained the windowsill. And that smell! At last, after midnight, they descended the stairs. Mr. Krook’s shop—crammed with dirty rags, bottles, bones, and other hoarded trash—was unpleasant even in daytime. But tonight they sensed something positively evil. Outside Krook’s bedroom near the back of the shop, a cat leaped out and snarled. When they entered Krook’s room, the odor choked them. Grease stained the walls and ceiling as if it were painted on. Krook’s coat and cap lay on a chair; a bottle of gin sat on the table. But the only sign of life was the cat, still hissing. The men swung their lantern around, looking for Krook, who was nowhere to be seen. Then they saw the pile of ash on the floor. They stared for a moment, before turning and running. They burst onto the street, shouting for help. But it was too late: Old Krook was gone, a victim of spontaneous combustion. When Charles Dickens published this scene in December 1852—an installment from his serialized novel Bleak House—most readers swallowed it as fact. After all, Dickens wrote realistic stories, and he took great pains to render scientific matters like smallpox infections and neurological disorders accurately. So even though Krook was fictional, the public trusted that Dickens had portrayed spontaneous combustion with his customary precision. Most of the public, anyway. A few readers were outraged by the scene. After all, scientists had been laboring to debunk old nonsense like clairvoyance, mesmerism, and the idea that people sometimes burst into flames. And key discoveries about heat, electricity, and other phenomena provided strong support for their view, showing that the human body, far from being otherworldly, was subject to all physical laws of nature. But the science was still behind. And there were enough mysteries for old wives’ tales to retain a foothold. This only made both sides more desperate to prove their case, and within two weeks skeptics began challenging Dickens in print, inciting one of the strangest controversies in literary history. Leading the charge was George Lewes, a Victorian-era Richard Dawkins—always ready to attack superstitions. Lewes had studied physiology as a young man, so he understood the body. He also had a foot in the literary world as a critic and playwright and as George Eliot’s longtime lover. In fact, he counted Dickens as a friend. In private letters to Lewes, Dickens continued his defense, mentioning several historical cases of spontaneous combustion throughout history. He leaned especially hard on the case of an Italian countess who had reportedly combusted in 1731. She bathed in camphorated spirits of wine (a mixture of brandy and camphor); the morning after one such bath, her maid walked into her room to find the bed unslept on. As with Mr. Krook, soot hung suspended in the air, along with a yellow haze of oil on the windows. The maid found the countess’s legs—just her legs—standing several feet from the bed. A pile of ashes sat between them, along with her charred skull. Nothing else seemed amiss, except for two melted candles nearby. And because a priest had recorded this tale, Dickens considered it trustworthy. He wasn’t the only author to write about spontaneous combustion. Mark Twain, Herman Melville, and Washington Irving all had characters erupt as well. Much like the “nonfiction” accounts they drew from, most of the victims were old, sedentary alcoholics. Their torsos always burned completely, but their extremities often survived intact. Eerier still, beyond the occasional scorch mark on the floor, the flames never consumed anything but the victim’s body. The strangest part? Dickens and others did have some science backing them up. Spontaneous combustion was linked to one of the most important discoveries in medical history, one that revolutionized our understanding of how the body worked—the discovery of oxygen. After chemists isolated oxygen for the first time in the late 1700s, they noticed that it played a role in both burning and breathing. With that, many scientists declared that breathing was nothing but slow combustion—a constant burning—inside us. If slow fires burned inside us all the time, why couldn’t they suddenly flare up? Especially in alcoholics, whose very organs were dripping with gin or rum. (Plus, not to put too fine a point on it, we all pass flammable gases several times each day.) As for what sets the fires off, perhaps it was fevers or raging hot tempers. Lewes, however, wouldn’t back down. He dismissed Dickens’s sources as “humorous, but not convincing,” noting that several were more than a century old. It didn’t help that Dickens enlisted the support of a celebrity doctor who promoted the fad pseudoscience of phrenology as well. Lewes also pointed out, rightly, that no factual accounts of spontaneous combustion had been written by eyewitnesses: They were all collected secondhand, from a cousin’s friend or a landlord’s brother-in-law. Most damning of all, Lewes cited recent experiments in physiology that revealed how the liver metabolizes booze, breaking it down for elimination. As a result, the organs of an alcoholic aren’t soaking in alcohol. Even if they were, science had shown that the body is roughly 75 percent water, so it couldn’t catch on fire by itself. Not to mention, it was obvious to doctors by then that fevers don’t burn nearly hot enough to ignite anything. Not surprisingly, Dickens dug in. His relationship with science had always been ambivalent: He couldn’t deny the marvels that science had wrought, but he was fundamentally romantic and thought science killed the imagination and undermined Christian life. He also detested society’s growing dependence on data and reductionism. Artistically, Dickens considered the scene with Krook so central to the novel (which involves a ruinous court case that consumes the lives and fortunes of everyone involved) that he couldn’t stand it being picked apart. And the more defensive Dickens got, the more disgusted Lewes became. They bickered for 10 months, before mutually dropping the matter when the final installment of Bleak House appeared in September 1853. History, of course, has judged Lewes the winner here: Outside of the tabloids, no human being has ever spontaneously combusted. In reality, practically every “spontaneous combustion” case has found the person to be near a fire source like candles or cigarettes. They likely accidentally lit themselves on fire, and clothing, fat tissue, methane gas, and (if it’s built up from alcoholism) acetone kindled the unfortunate blaze. Still, Lewes and other scientists didn’t understand as much as they assumed. For instance, they believed that the combustion of energy inside us took place inside the lungs and not, as we now know, inside cells themselves. 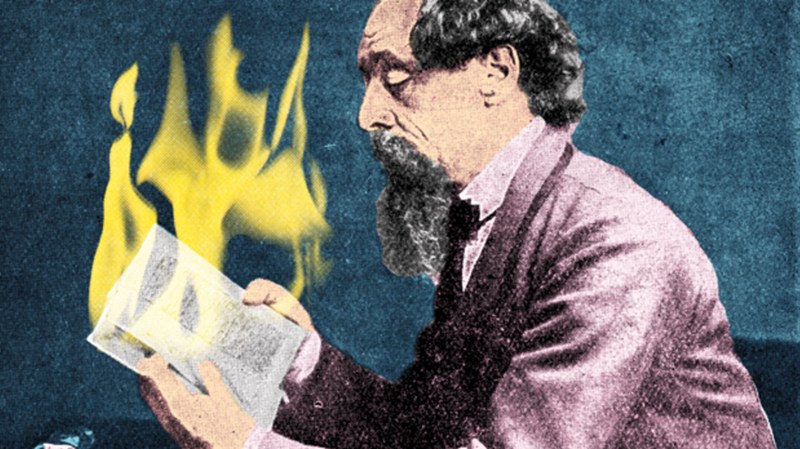 Dickens’s popularity no doubt delayed the death of spontaneous combustion in the popular mind. (One medical text was still discussing claims of spontaneous combustion as late as 1928.) But Dickens was certainly right about one thing: that in human affairs, spontaneous combustion does happen. Friendships and reputations can ignite instantly and leave little in their wake. Dickens and Lewes eventually patched things up and seemingly never spoke of the matter again. But for much of 1853 the fires burned awfully hot.